A dummy player is a simple viewport into the world that has no physical properties and cannot collide with objects. As any transformation of a player forces it to recalculate its inner state (position, direction, angles, and so on), the up direction of the player's viewport may become "negative forward". And then transformation will be recalculated by using this direction, causing flip of the player's basis. To avoid such flipping, the theta and phi angles should be recalculated by using the current viewing orientation of the player. On the Menu bar, choose Create -> Camera -> Dummy. 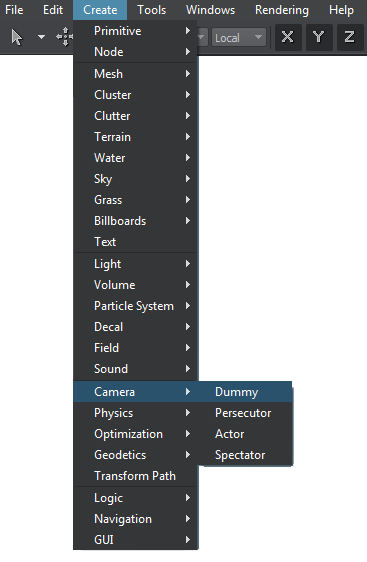 In the Player Dummy section of the Node tab, you can adjust the bit masks and viewing frustum parameters of the dummy player and assign post-process materials to be applied to the camera view.